Doctor Tina Falika King completed her OB/GYN Residency at York Hospital in York, Pennsylvania following her medical school training at The Ohio State University College of Medicine. While at Ohio State, Dr Falika King also received the NIH Roadmap Training Grant, which allowed her to obtain her Masters of Public Health in Clinical Investigations. 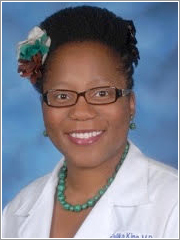 With a passion for patient education and her Masters’ research interest in High Risk Obstetric and Perinatal Complications, upon completion of her general OB/GYN training Dr Falika King came to Northern Virginia and obtained additional High Risk Obstetrics training with the Perinatal Team at INOVA Fairfax Hospital. With her formal training now complete and hoping to cultivate her passion for patient education and a patient-centered approach to women’s healthcare, Dr Falika King is excited about her new role with the Physician’s and Midwives Collaborative Practice. Dr Falika King grew up in Northern VA, so she is very excited to remain in the area to raise her family with her husband, Aaron.